Game, set and match made in heaven! Every January, the best of the best tennis players touch down in Melbourne for the Australian Open. And when tennis royalty come to play, we often catch a glimpse of their partners seated in the stands who've accompanied them to be their cheerleaders. But who are these people? We know grand-slam champ Serena Williams is married to Reddit co-founder Alexis Ohanion and the two share adorable daughter Olympia, but as for the men, it's time to meet the first ladies of tennis. Check out all of the top WAGs you can expect to see here. Bad luck ladies, Roger is taken. The Swiss star met his wife Mirka, a fellow tennis ace, in 2000 at the Sydney Olympics when they were both representing Switzerland. In fact, it was in Sydney where love really blossomed for the couple. "We spent two weeks together, that's how we got to know each other and on the last day before we left, we kissed for the first time," Roger previously told the Daily Mail. Roger and Mirka married in a small intimate ceremony in 2009 and welcomed twin girls Myla and Charlene, nine, a few months later. They then became parents again to twin boys, Lenny and Leo, four, in 2014. The couple also have friends in high places, they famously attended the wedding of Pippa Middleton and James Matthews back in 2017. Now retired due to injury, Mirka can often be spotted in the crowds supporting her husband and Roger has previously stated that she does a lot of work to keep the family in check. "We have the grandparents as well and all my team members, they sometimes just tag along," he said. "Clearly we also need some help on the road, so Mirka can have an opportunity sometimes to sleep in a little bit, or come to watch one of my matches." "You need to be well organised, but by now we know how it works." Nicknamed Xisca, Maria has been dating Spanish tennis ace Rafael Nadal since 2005. And their romance goes way back, as the two grew up together in their hometown of Palma de Majora in Spain. Xisca isn't across social media and devotes her time to her work. The brunette beauty graduated with a degree in business management and administration from the University of Palma and in 2016, she became the Director of Social Integration for The Rafael Nadal Foundation. Unlike some of the other tennis WAGs, it's not often that Xisca goes to grand slam tournaments to cheer on her partner and she says it's to keep their relationship healthy. Speaking to The Telegraph in 2011", Xisca said, "He needs his space when he is competing, and just the idea of me hanging around and waiting on his needs all day tires me out. Scottish tennis star Andy Murray met English rose Kim Sears in 2005 at the US Open after her dad, who was the then head of the Women's Tennis Association, introduced them. Since then, they've been Britain's tennis golden couple and Kim regularly attends Andy's matches around the world. In fact, Kim made international headlines when she wore a 'parental advisory' jumper to Andy's final at the 2015 Australian Open after she was caught swearing in the stands at the previous semi-final. What a legend! The couple married in Andy's hometown of Dunblane, Scotland and are proud parents to daughters Sophia, two, and Edie, 14 months. "Kim's always been there for me. She really cares about me and helps with so many things. She always has, that's why we have such a great relationship," Andy penned in his autobiography, My Road to Wimbledon Glory. Though Novak and Jelena met in high school, the two didn't start dating until 2005. The Serbian sports pro and his wife married in 2014 and a few months later welcomed their son Stefan, four, and then in 2017, announced the arrival of daughter Tara, 16 months. Jelena's Instagram is jam-packed with adorable pictures of her family and it seems she's a fan of documenting memories. Speaking to ESPN, Novak said that his wife "likes to go in depth and analyse everything in detail," confessing that she encouraged him to pick up her habit of writing in journals. "She helped me to identify the emotions and feelings of everything that is going on and understand the big picture." Jelena is also the director of their charity, the Novak Djokovic Foundation, which aims to improve the Serbian education system and help children achieve their dreams. He may be famous for his controversial actions on and off the court, but on a personal note, Bernard Tomic seems to be all loved up with his girlfriend, Emma Blake Hahnel. The Melbourne-based model is particularly active on Instagram, though there haven't been as many couple snaps on her profile as of late. However, Emma, who met the 25 year-old tennis star and I'm A Celebrity contestant at the Crown casino when she was 19. says he's very misunderstood. "When you know him like I do he's a really funny, sweet guy. He just says things that come across that way and just defends himself. He's not a politician. He doesn't say things because we want to hear it. He just says what he thinks," she told the Herald Sun in 2017. Don't expect to see much of Ajla Tomljanovic in the stands, she's out on the court defending her own title! Croatian-Australian star Ajla has been in an on-off relationship with the tennis bad boy since July 2015. They went public with their relationship at the 2016 Australian Open and even played together in doubles. Talk about a tennis power couple! Nick and Ajla reportedly broke things off in mid-2017 after salacious snaps of Kyrgios partying with two young women at a London nightclub during the Wimbledon tournament surfaced, but it seems that shortly afterwards, they had patched things up. Despite their 11 year age gap, Swiss tennis ace Stan Wawrinka and his girlfriend and fellow tennis player Donna Vekic have been dating since 2015. Stan was previously coupled up with television presenter Ilham Vuilloud, but they split after six years of marriage. Donna was caught in the middle of a nasty scandal in 2015 when during a match against Stan, Nick Kyrgios alleged that his friend and fellow tennis player Thanasi Kokkinakis had slept with Donna. "Kokkinakis banged your girlfriend. Sorry to tell you that mate," Kyrgios said. But despite struggles, both professional and personal, Donna says that their relationship is rock solid. "We love what we do and we support each other, even when we are not together. I think we can do well," she told Tennis World in 2018. Now that's what we call a dreamy wedding photo! French player Jo-Wilfried Tsonga married his Swiss leading lady, Noura El Swekh, at a French chateau in July last year. And we would've loved to have been flies on the wall at those nuptials: tennis legends Boris Becker and Andy Murray were reportedly present to watch the couples exchange vows. The couple, who started dating in 2014, also share a son, Sugar, who was born in March 2017. Noura's Instagram is overflowing with adorable baby pictures and we can't get enough! Czech superstar Tomas Berdych will have his stunning 26 year-old wife cheering him on in Melbourne. And the city has a special place in the couple's hearts as it was at the 2014 Australian Open that Tomas and Ester announced their engagement after three years of dating. The couple then tied the knot in a small intimate ceremony in Monaco. A model since her teens, Ester is signed to modelling agencies in Italy, Spain and Malaysia so with that and supporting her husband, she keeps herself busy. With Tomas hoping to secure his first grand slam title, could 2019 be the Berdych's year? "Happy new year #world it's been a ride so let's make a even better in 2019!! My love and my 👼🏻," the tennis star posted on Instagram to celebrate the new year. They haven't officially confirmed their relationship, but an insider told Tennisplaza in September 2018 that Canadian tennis star Milos Raonic, 28, has moved on from his ex Danielle Knudson and is 'intimately dating' Belgian model, Camille Ringoir. Camille, 25, who started modelling when she was 13 and has graced the covers of Elle Czech, Marie Claire Belgium and Elle Singapore. 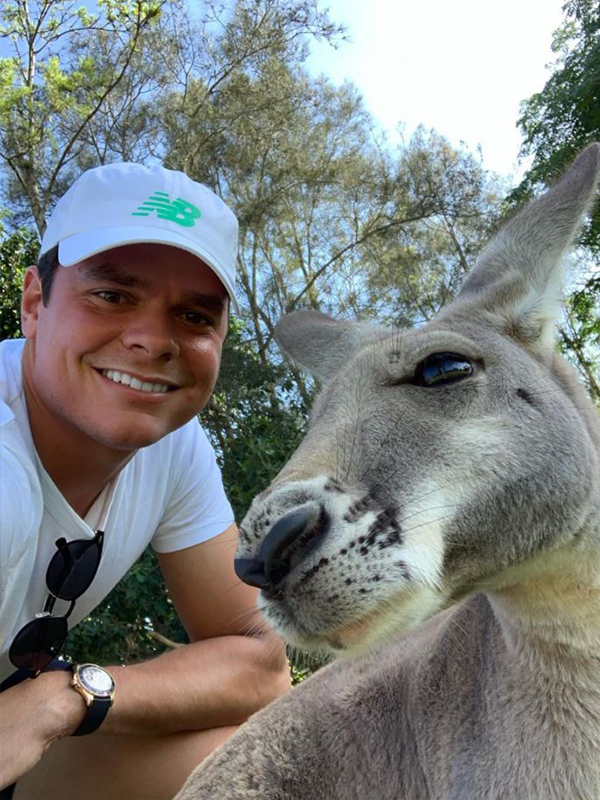 When she was spotted at the Brisbane International just days ago, that seemed to be the confirmation the world needed that she and Raonic were an item. They also shared some cute snaps of themselves at Brisbane Zoo with some kangaroos on their respective Instagram pages so it doesn't take a genius to assume they went together.